A proposal to upgrade the U.S. arsenal has sparked an explosive debate. 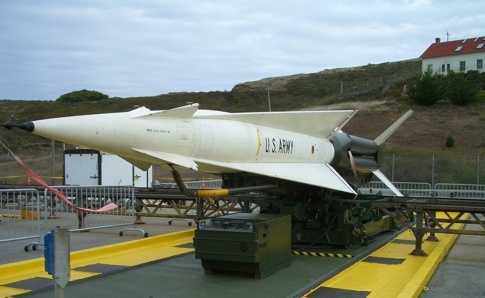 A Nike missile on a restored base in the California Marin Headlands. Government officials will soon need to deal with the United States' aging nuclear arsenal. [Credit: Todd Lappin, flickr.com]. U.S. nuclear warheads might have been technological marvels a half-century ago, but today they’re akin to a fleet of ’57 Chevys — at least according to those who say the U.S. arsenal is begging to be traded in for a new model called reliable replacement warheads, or RRW. For the last half-century, the U.S. has maintained its 5,400-warhead arsenal by replacing degraded plastic and rubber parts. But the most important part of the warhead — its explosive radioactive core — naturally decays over time and has not been replaced. The warheads will remain dependable for at least 82 more years, or until the year 2091, according to a 2006 report by JASON, an independent scientific advisory group for the U.S. government. At that point, the warheads’ decayed cores could leave the U.S. with an impotent nuclear arsenal. “The concern is, can we keep the nuclear arsenal safe, reliable and effective for as long as we’ll need nuclear forces?” says John R. Harvey, a physicist in the U.S. Department of Energy’s National Nuclear Security Administration. Although experts are pushing Congress to fund replacements for the aging warheads, lawmakers have balked. Last May, Congress refused to fund a $9.4 million RRW research initiative, and more recently, the power shift brought by the 2008 elections led proponents to abandon the RRW budget request for fiscal year 2010. “A Democratic Congress is not going to approve a budget created by a Republican [like Pres. Bush],” says RRW supporter Maj. Gen. Robert L. Smolen, deputy administrator for defense programs for the National Nuclear Security Administration, who adds that there is “no funding whatsoever” for warhead development for the upcoming fiscal year. Still, RRW proponents haven’t given up on the program. They hope to eventually seek approximately $60 million to fund three to four years of research to develop a timeline, strategy and budget for a new arsenal, according to Smolen. The entire program, he says, could ultimately cost billions of dollars. Anxiety over the U.S. arsenal centers on the age of the warheads’ plutonium core, called the pit. This radioactive center triggers the explosion that is the source of a nuclear bomb’s extraordinary power. When a bomb detonates, highly explosive material compresses the core, setting off an uncontrolled chain reaction that splits the nuclei of the plutonium atoms, releasing the energy found in up to half a million tons of TNT. If this plutonium-based process fails, the weapon does not explode. Over time, the core loses mass and energy by emitting tiny particles through a process known as radioactive decay, and impurities build up in the core. The conditions required to start the explosive chain reaction are so precise, “there is always concern that if the core changes slightly, the compression might not go in a predictable manner,” says Mark Sakitt, a nuclear proliferation expert at Brookhaven National Laboratory on Long Island. The degradation of this radioactive material could destabilize the cores to the point that the weapons detonate weakly or not at all, RRW proponents say. To reduce this risk, RRW could combine a variety of safety features to keep active warheads out of terrorists’ hands. Just as seatbelts made cars safer for passengers, “technology now allows safety features into nuclear warheads,” says Harvey of the Department of Energy. Bombs, for example, can be programmed to detonate only after sensing a specific environmental signal such as a predetermined change in speed. Combining this feature with others would create a new “enhanced” warhead, according to Smolen. “The only thing [a terrorist] would have is a hunk of radioactive material that they couldn’t do anything with,” he says. RRW backers also say relying on aging weapons opens the door to nuclear proliferation by prompting the more than 30 countries protected by U.S. nuclear forces to pursue their own arsenals. “There are allies capable of developing nuclear weapons who may feel they need to go nuclear if they can’t count on the United States,” Harvey says. A non-nuclear nation like Japan, for instance, could decide to build an arsenal of its own and has the industrial and intellectual capacity to do so, according to Smolen. Still, opponents of RRW point out that the warheads remain dependable. “The bottom line is that the current U.S. arsenal is safe and reliable,” says Stephen Young, a senior analyst for the Union of Concerned Scientists, a Boston-based advocacy group lobbying to reduce nuclear threats. Combined with the high projected cost of the program, this reliability makes RRW a poor use of U.S. funds, opponents say. “There’s no need to replace the warheads, and [it] would be a vastly expensive endeavor,” says Devin Helfrich, a legislative advocate for the Friend’s Committee for National Legislation, a peace lobby in Washington, D.C. Many also say the U.S. should be working for a nuclear-free world instead of developing new nuclear technology. Sakitt says he believes RRW sends the wrong message, and many critics worry that pursuing the program could undermine U.S. efforts to pressure nations like Iran and North Korea to cease nuclear development. “Reliable replacement warheads are a step in the wrong direction,” Helfrich says. It may even be possible to quell concerns about the reliability of the nuclear arsenal without developing new warheads, says Young of the Union of Concerned Scientists. Replacing the rapidly decaying radioactive tritium gas in the core with a new sample, for instance, is one simple way to increase a weapon’s reliability, he notes. The Department of Energy takes steps to harness the energy beneath our feet. Why is it taking Iran so long to make a nuclear bomb? cool. now i understand the problems of geriatrics in weaponry. it’s important not to have a weapon with parkinsons disease. illustrative, lucid and informative this article is a a great piece of work. i never knew the importance of balancing the core, the pit, to set up the right reaction for explosion to work. now i do and thanks to ms. bond.